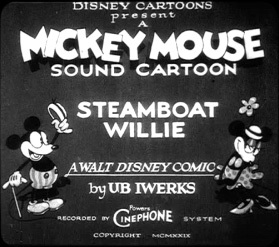 The cartoon debuts Mickey Mouse and his hilarious high jinks as he works on a steamboat with the captain, Pete. Mickey is regularly punished and he uses the other animals on board as a means to his own end until the film closes when Pete puts him to work peeling potatoes. The film also features the introduction of Minnie Mouse. Walt Disney was inspired to create a sound cartoon after watching The Jazz Singer (1927). 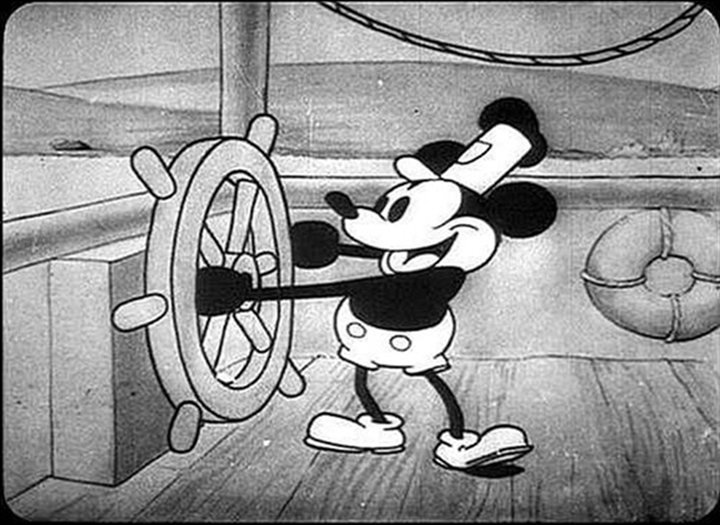 Though there were other sound cartoons released throughout the mid 1920’s, Steamboat Willie was by far the most successful and popular. Disney had also made other silent cartoons prior, but they did not make as much of a splash as this film. Ub Iwerks was Disney’s animator who co-created Mickey Mouse. The budget for the film was $4,986. In order to screen the idea of the film, Disney hosted a small screening for Disney employees and their wives while playing the songs and sound effects live behind a curtain. It was a huge success that gave him the confidence to complete the project. However, the film has garnered controversy for the status of its copyright. Though it was intended to enter the public domain, Disney lobbied congress for an extension that now lasts until 2023. This classic cartoon is definitely worth watching time and again, not simply for the novelty of sound joined with moving picture, but also for its innovative production.